This most excellent blog promises to provide useful educational technology information for the everyday teacher that either uses technology a lot or just wants to use it a little more in the classroom. Join the adventure! Give it a try and see if it is better than Evernote or just a copycat service. But as a lot of people are saying on the Web, don't get too attached. Google has a habit of removing services that we all love. 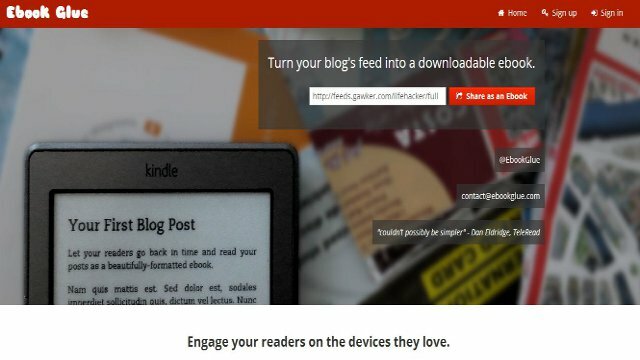 I just got a tweet the other day about a new Website called Ebook Glue that lets you take a Blog, RSS feed, or Atom feed URL and turn it into an Ebook. It will give you a shareable link where you can download either ePub or Mobi formats. Here is an example of the Ebook for this blog. After trying it, the pictures and videos that are embedded did not show up, but the links and the text worked great. I think this is a great tool for English or Language Arts teachers that want their students to write using blogs and then publish their finished products as Ebooks. Downloadable to your favorite device. Cool! Thanks for the tweet Ron! Just read a great article posted on Tech & Learning about the 10 Tech Skills Every Student Should Have by David Andrade. I though it hit the nail right on the head with the skills listed. Also helpful was the multiple links under each item as a resource. Great job! A collegue of mine just told me about a new music site called Songza. It is a new (at least to me) that is quickly challenging sites such as Pandora or Spotify. The big appeal seems to be no audio commercials. Give it a try. I just downloaded the app on my iPhone and it is also available for Android. Sounds pretty cool. Of course it is so cool that most of the courses cost money. Rats! But, there are a few free courses to wet your appetite. Code School, check it out. Over the past year or so, I have heard the term "Blended Learning" tossed around my high school quite a bit. If you have never heard of the term, or have and are unsure exactly what it means, the following video does a great job of breaking the concept down and explaining it. After watching it, even I understood it. Is this type of instruction something that would work well with your students? I tend to think that it is great for some and not great for others. Not surprising, huh? Food for thought on a Friday. Agree or disagree (and I do), it brings up some great points for us to think about. I am a computer teacher at Sparta High School and have been in education for over 20 years with stops at Ottawa Hills, Ravenna, and Fruitport High Schools. I currently teach Intro to Computers, Desktop Publishing, and Computer Programming.